Set out the suitcase your kid(s) will use. This is a great visual so they can see they can’t bring their entire stuffed animal collection. The tip here is DON’T let them actually pack the suitcase. They’re going to gather the items and you’ll pack them in the suitcase. This gives you the final view of what they’re bringing. I’ve had to use my best manipulative mom techniques over the years to “recommend” some removals and/or additions. Choose your battles wisely. Prepare a packing list for your kids. My “list” has varied during the years. Sometimes it’s all been handwritten on one sheet of paper. Other times it’s been individual slips of paper. I even tried a white board once. The idea is to get your kids to pick an outfit for each day of the vacation. I’m including some free printable kids packing lists to help you with this part. Hopefully one of these styles will work for you or inspire you in your own list making. Have your kids set out each “day outfit” and extras on the floor/bed. This is the time that helps you. While they’re working on getting their clothes gathered, you can work on your own suitcase. Review and Pack their selections. Did they choose each outfit wisely based on the activity for the day? Did they remember underwear & socks? Now, using whatever packing method you like (I’m a roller!) you can pack their suitcase quickly. Congratulate your kid and thank them for their work. This gives them ownership of the task (they won’t complain about any of the outfit choices because they picked them) and helps make them a part of the pre-trip preparation. Great idea! I’d like to try this with my oldest as he can almost read. It might be fun to make one with just graphics for preschoolers. One other idea is to laminate them so you can use them again if you travel frequently. Thanks for sharing! Great idea! Can’t wait for the non-reader version as my little one will just pick out dresses, which is not so practical on many occasions! Kiera, I’m really excited to create a picture version! I’m just trying to wrap my mind around how to make it work and happen. I’m hoping to post it soon, maybe even next week! Thank you for the printable sheets. I’m totally going to try this next time we’re going somewhere. I swear I usually spend so much time packing the kids that I almost always forget something of my own. Patty, glad to help! It really does help to get everyone working towards managing their own stuff. Helps us speed up our vacation prep time. 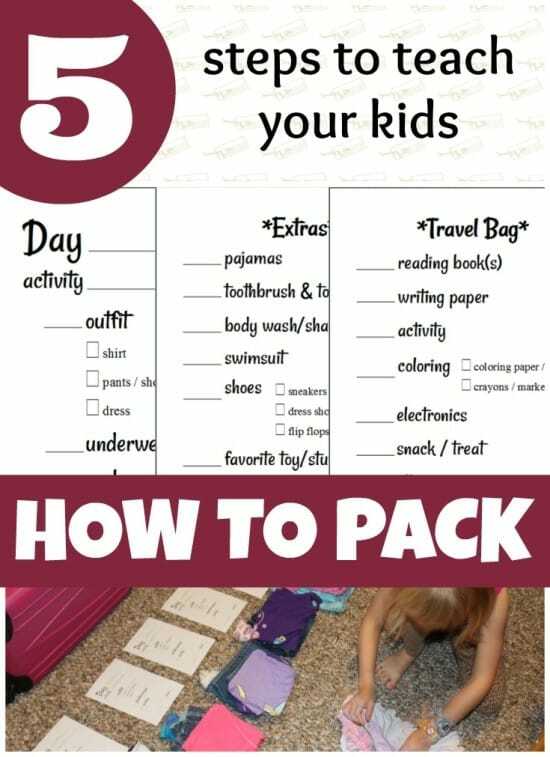 Love the packing lists it is a great way to hold ur kids accountable for their travels while getting us moms out if the “mom why didn’t u pack the……,,” we will be using this method from now on. Any different list to use for camping available? You are one smart (and organized) cookie. My children are all grown, but I taught them to pack at a relatively early age. But I would find myself constantly checking behind them. Wish I would have had your system then. How totally awesome and PERFECT! I will definitely pin this for later use! I never would have thought to use a checklist system with the girls to teach them how to pack. Hi SouthernMessMom! I’m glad you like the list and that it might help you. My girls love being able to pick out their own clothes/outfits, so they really embrace the checklists. Gives them just enough power and responsibility, but helps you input a voice of reason! Love! At what age would you say you could start doing this? M daughter is two, so I don’t think she is ready just yet! Hi Jenna! My youngest started around age 3 I think. What I would do is verbally give her each day’s directions. So I’d say, “Faith, go pick out one shirt and a pair of shorts. Add some underwear and socks.” That worked well in the early days. However the great news is…I’m developing a non-reader version too! HOW AWESOME it this post. I am OCD (I mean organized about everything). I love this idea of lists. My kids are way to young still, but I just love the idea of helping them learn to pack, will teaching them the importance of reading and helping them with self accomplishment. My girls do feel a lot of pride and really enjoy being involved in the process. Another way to make family travel about spending time together as a family! Your post is well written…just don’t know if I would trust a child to pack their own luggage. I suspect that I would want to go over it…suppose dry runs would be good until one is sure they understand. This is fantastic—for adults who have trouble packing as well as for kids. People have a tendency to over pack when traveling—you’d swear they were going to be out of the country for months when they’re just going to the beach for a week! Your system makes you consider your choices based on activities and location. Love it! Hi Elle! You’re right that it helps adults make choices. We always use carry-on suitcases, because of the expense and not wanting to wait. By making careful choices based on your itinerary, you can save some money and time! What a great way to help your kids organise for a trip. Having daily check lists like that is perfect to make sure they have enough clothes etc for the whole time! I’m going to remember and try this for our next trip! Thanks for sharing. Thanks Jill. I really love seeing that it is going to help other parents with their own travel packing! Three things (at least) I love your theme; would love to know what you are using. I love your header; it tells your readers in one glance what you have to offer is fresh, lighthearted and very useful. Your color choices are delightful; I feel like I’m on vacation already – just reading this. Wonderful post and wonderful site! I hate packing. It literally gives me headaches. My older daughter already packs for herself though. My younger one only packs her own toys. I find that if you have a plan, packing becomes less overwhelming. I’m working towards creating all sorts of packing lists for my site (did you see my Customizable Spreadsheet Packing List?). If you follow me, perhaps I’ll have a packing list that will help make it a little less painful! :) Thanks for visiting Jeryl! I really love this post and download the printables. Self packing will train independency. Thank you very much for sharing. Great post! I need to pin it for the next time we need to pack for a trip. I’m not a good packer myself so these tips will help me as well! Thanks! I love hearing about people pinning my stuff! Hope the Pin It button worked for you. Thanks Michelle! This is what I need! Thank you so much for sharing! I tweeted this! Glad you enjoyed it Trista! Thanks for the tweet! What a cute idea… as a teacher I appreciate your lesson plan-esque activity. Thanks Jacky! Plan-esque….love it! :) My brain only works that way! This is such a great idea! I think that your printables could be used for kids as well as adults – I think every time I get back from a vacation, I find about half of the items in my suitcase weren’t even worn. I’ve definitely gotten better – my husband and I recently fit all our stuff in 1 suitcase – a big feat for us!! Congrats on your recent accomplishment Becky! :) With the baggage fees these days, you really can’t afford to bring along excess stuff. That’s AWESOME! What a great idea. Do you think it would work with my husband?! LOL. I don’t pack his suitcase but sometimes I wish I had!! Funny! I do think some husbands could definitely benefit from a plan for packing! :) Thanks for visiting Bethany. Love your theme and layout! What a great blog post. I downloaded and printed the PDFs for my granddaughters, thank you! Thanks for stopping by Cherri. I’ve been working on my blog a little bit at a time and I’m finally getting it where I want. I hope your granddaughters have fun with the packing lists! Wow, you are such a great mom! One day, when I get married and have kids, I’d definitely will do that as this is a smart idea! Awww, thanks Sila! Best wishes in your life journey! OMGosh – I’m going to use these lists FOR MYSELF for my trip next week! I agonize over everything that I put into my suitcase. I always end up with too much stuff or not enough stuff. This is GREAT! So glad you like them Libby! Hope they work well for him Linsey! I love this! I’m a big fan of lists (especially when traveling) and I consider myself a championship packer…I think of packing suitcases and cars like playing tetris lol. I don’t have children of my own yet, but this is definitely info I will tuck away until the day I *do* have children, to help teach them how to pack appropriately and efficiently. Thank you! Tetris, totally! My husband likes to call me the “spacial expert” of the family. :) If you’re on Pinterest, you can use the Pin It button on the page so you’ll have them ready if/when you have kids! What a get idea, before you told about the free printouts I didn’t think this would work for me. I love the whole process. Thanks. Hi Crisi, I’m glad you found the printables helpful! So awesome! We have a trip next month and I will so be using this! Thanks! So glad they’re useful Jesi! Hope you guys have a great trip!! What a great idea. I love thinking of things for your kids to make your life easier and get them prepared for adult hood. I work with 2nd graders and we are always trying to get the students to think for themselves and also for the parents to stop doing everything for them. Thanks Candi! While not a school teacher, I like to see my role as parent as a teacher too! :) Getting your kids to do stuff on their own helps them and you! I sort of want these lists for myself!!! I love that you include what is going to be happening each day on your packing lists, so they can really think about what they’ll need there. I still do most of my kids’ packing, but I’ve pinned this post because those printables are simple enough that I think I could use them for our next trip. Thanks! I’ve learned that I need to think that way for my own packing — “what are we doing each day”. I’m glad you pinned the lists. Thanks! Look for a non-reader version soon! So glad you liked them Karen! My girls do like how it helps them yet also lets them have some control. This is a great idea. I don’t have kids yet, but this makes it sound way easier to get them packed. Thanks for the free printables! You’re welcome Missy :) Thanks for visiting my site! LOVE this. I pinned it to my family travel board. My little man is just 2, so we’ve got a while, but we travel all the time so I know it will come in handy later on. Thanks Becca! I’m working on a non-reader version that I’ll be posting soon! Glad you like them Ginger! Great post, and so organized!!! I think your kids might pack more efficiently than I do! I might need you to come help me pack! Thanks so much Chris! I love hearing about others using them for their travel! This is awesome and I LOVE the printables! I’m actually going to try this for a weekend trip we’re going to be taking this upcoming weekend. Thanks! WooHoo! That’s great Alison. Hope you have a great trip! Very good post. I agree that it is especially a good time to give the kids ownership of their own choices that they have made. They can’t blame anyone else that they didn’t bring their favorite top or shoes. Exactly Lisa! Great for them to have some ownership and responsibility. LOL This is how I pack my own suitcase! My oldest is only 3, but I think she could do some of this on her own next time we go away. Thanks for sharing! So good Olivia! It’s how I think through my own packing which is why I tried to translate it for my kids. :) Check back later this week for a non-reader version perfect for the preschool crowd. Absolutely Tim! It’s how I figure out what to bring on trips! Great idea! I just might have to use this when I pack! lol! Laminating or using a sheet protector also is a good GREEN move. Not having to print new sheets for every trip. That’s why I made a 1/2 sheet day version so you don’t have to use full sheets of paper! :) Thanks for stopping by! Thank you! I have such a hard time getting my 11 year old to pack CORRECTLY, I think this is a good way to keep it super structured while still letting her do it herself. So glad you like it Aubrey! Hope it works well for your next trip! I love this idea! I think my oldest is still a little young for this– 3 year old boy– but maybe in the future. If you end up creating a version of this for the non-readers as you mentioned in the comments, let me know. The packing tip that has helped me the most is putting each child’s clothes in a container (I just use reusable bags) inside our family suitcase. This made it a lot easier for me to stay organized during the trip. It looks like your daughter has her own suitcase, so that would work as well. Anyway, thanks for sharing. I posted my non-reader kids packing list today Jennifer! I’ve used the ziploc bag idea before, but since we like to save money we just all take our own carry on size suitcase. I’ve had the girls share one before for a short trip, but they each get one side of the hardsided suitcase so it stays separate. Thanks for visiting! I love those lists!!! I usually make my own list (a piece of paper divided into each person and then what each person needs) and pack all of us on my own! This is superb! Thank you for sharing! I can’t wait to put it to use! Hi Leila! I’m so happy that you like them! Oh man, I wish I’d seen this a few days ago! We are leaving on a 10-day trip today and it was maddening trying to let the kids help me pack their stuff. I will be bookmarking this for next time! Oh, I will definitely be using this when Liv is old enough to pack her own bag! Great post! Great Jen! Hope it helps you when you travel! Visiting from SITS. What a great post on packing, I’m going to use this idea – making them pack & giving them a list of guidelines. Time saver! Hi Anna! I’m so happy you came by to visit :) Glad the ideas and lists will help you! This is a really great post. Thanks for sharing. Hi Patricia, I had a lot of fun writing it! It’s one of those things I knew could help other moms & dads! I love these lists and love the idea of making travel easier for mom by giving more responsibility to the kids! Glad you like them! Thanks for visiting Jessica. You do have to help the preschoolers initially. I find having the separate outfit pages really helps them stack and make piles. Then you can review and pack the items away in a neat manner. Thanks for sharing some game ideas! Wow! How exciting Kristina!! I’ve got your blog hop noted on my daily calendar so I’ll be linking up new stuff tonight. I can’t wait to see my feature and add the button to my blog! Thanks! It looks like there may be hope for me teaching my kids how to pack! Great tips — thanks! I’m happy to see so many people getting use out of them! Enjoy your future travels! This post has been featured by two other blogs. I’m so happy to see my ideas helping others! Thanks so much for visiting! I’ve also found that when sending them off to overnight camp, it’s easiest for them to pack an entire days worth of clothes into a 1 gallon size ziplock bag. I go one step further and have each bag labeled for the day of the week, swimsuit and one pag that says “extra”. My son reports it’s so much easier to grab the day’s bag, and head off to the showers while the other campers are still trying to pull out socks, underwear, shorts, etc..
Hi Michelle, the ziploc bag idea is definitely a great way to stay organized and grab your clothes quickly. It’d be great for families who are camping with communal showers too! I’m using your list to help my sons get ready for school in the morning. It was painful today, so I attached the list to a paper grocery bag and told them to pack. Way to think outside the box! :) Thanks for stopping by and sharing! They packed the bag last night. This morning didn’t have any arguments, no “where is…”, “Mommy find…”. Peaceful. 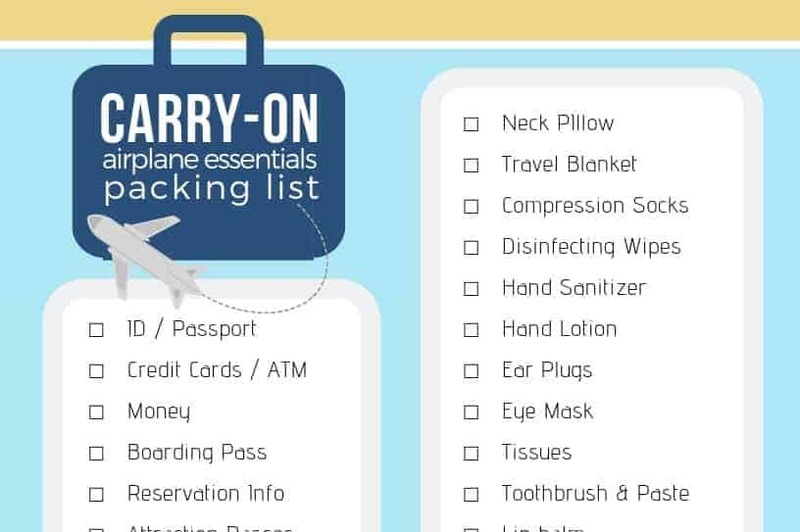 Great packing lists printables! I think I need to give these to my husband, too, since he sometimes forgets things. Ha Michele! You’re not the only lady who’s mentioned that to me. :) I did make a customizable spreadsheet packing list that works well for adults (but it’s not broken down in the cute day-by-day format). Love this! For a recent holiday trip I walked my daughter through packing and it was fun to see her get into it. Love those packing sheets though, I’ll try that next time! Hi Tricia! The slips really help keep them on task. At least for my girls! I love the printable packing sheets and totally use them for ME until my boys learn how to read :-) Very cool. Thank you and happy travels! Visiting from SITS – enjoy your day in the spotlight! Stopping over from SITS. These are great resources. Definitely pinning this post for our next trip. Great Tara! Hope they help! Looks like you’ve got it down to a fine tuned science. Isn’t it great when you figure something out that works? Thanks for sharing. Thank you Robin! Yes, I always have a little imaginary air fist pump when I find a time saver! LOVE! LOVE! this idea printing it out now! I consider myself pretty organized this idea is GREAT! Thank You! Go for it Lara! We’re all kids at heart, right? :) Glad they’re helpful! So you’ve experienced this too Kristin! It really is nice how most kids love being put in charge of a project, especially about something as fun as getting ready to go on vacation! What a great idea! My sons (8 and 5) have attempted to pack in the past, but they always forget things like underwear or pajamas. The checklists are a great way to get them focused on what to bring. Thanks for sharing! Absolutely Jennifer. Hope they help you (and your boys) for your next vacation! What a great, ready and even fun way to keep your Kiddies organized and prepared for a trip! Thanks for sharing and for the great printables! Happy SITS Day! Glad you like them Tiffany! It was a post written with the hope of helping others as I’ve seen it help me! We travel a bit, so I’m happy to find this. Thanks a bunch & happy SITS day! I just love to travel Jean! If I had more money and less responsibilities, I’d be gone every month! :) Happy travels! LOVE LOVE LOVE! We traveled over the winter break and it was the first time I had my kids pull their own clothes (don’t judge, they are 10 and 13 – I coddle, I know). I love the printable checklists. I think I will put mine in page protectors and use dry erase markers so they can be reused. LOVE! oh, and happy SITS day! Thanks for stopping by Marianne. I’m in love with your blog! Your tips are not so beginner and at a nice intermediate level, which is what I need! Hope this can help you with your own packing. I’m heading to Botswana pretty soon for two weeks and almost considered carrying on. Liquids are the only reason I won’t. :) Hope you have a fabulous trip! That’s so sweet of you to say Kimberly! Wow Botswanana? With the kids? Baby steps Marianne! You’ve made a good first step! omgosh that is hilarious! well have fun!! This is a great idea! I am much less organized. I too pack the night before or the morning of. I lay out the suitcases in front of me and then have each kid go get a designated number of each item. If we are going to be gone for three days, I usually ask for 4 of each for my older kids and five of each for the youngest. I have them each bring me a certain number of socks and we count for each person as they go in. We do the same for underpants, shirts and pants. Then we add pajamas and a spare pair of shoes. You still have the same idea Rabia! I find letting them stay in their own rooms keeps things more organized and lets me get focused on my own packing tasks. That’s true! I guess it’s helpful to mention that I’ve got three kiddos sharing one room and there would never be enough room on the floor in there for this! The living room works great for me! Ah, yes! Sounds like you’ve done a great job organizing the system to work for you all! Great tips! I love the idea of letting kids have a voice in/be responsible for the outfits and activities they bring on a trip. With some parental editing if necessary! Happy SITS Day! Hi Kimberly, visiting you from The SITS Girls. Great post. Teaching your kids how to pack alleviates your burdens, and also helps them to learn valuable things for their adult lives when they will packing to go away to college, etc. Very practical insights and HAD to pin it to Pinterest. Thank you Clotilde! I really appreciate the kind words & the pin!! You are most welcome, Kim. Wish you all best this year with your blogging! Great tips! I really like the idea of having a list for each day so that they can think about what they might need for that day. Exactly Bev! It really does help you focus on what you actually need to pack. Just found this! Love your tips. The eldest is getting to the stage where a proper list would just nudge him into being able to do it more or less himself. So glad you found it Bronwyn! Hope it works out for you!! This is awesome! My two older kids (6 & 8) have been packing themselves for some time (even for our recent Disney trip). The oldest one even packed her 3 year old brothers clothes for our spring break trip to grandmas (mom had procrastinated a little more than normal, lol). I love the idea of writing down the activity of the day! Thanks for the tip! I think this is a great thing, kids totally need to be taught how to pack early, especially for a future of traveling amazingness, it teaches them so much about the world around them, and they really get into the spirit of packing, and in sorting out the stuff that’s most important to them, so they learn how to prioritize. Thanks a lot for the printable sheet. Great idea for my daughter. She will turn 4 this year, and I want her to learn packing. Thanks Jean! It helps to start them early, and gives you so much more time to focus on your personal packing and to-do’s! Wonderful article and thanks for the free printables. If someone needs gear for the kids travel come to greattravelstuff.com, use the code stuffedsuitcase and get 20% off all kids travel items. Thanks Savannah! It’s saved our family a lot of stress and now that the girls are older, they’re experts at gathering their stuff. I still go in to review their choices and check over my list to make sure they packed the major stuff. It’s taken a lot for me to realized that if we forget something we can probably buy it, however the irreplaceable stuff is first on my list. Having a master packing list for the family really makes a difference to help keep you from forgetting the important things for your family! My kids have been packing since they could count. I’ve only told them how many days we were going to be gone and if where we were going was going to be hot or cold. I’ve always checked their clothes before we leave. If they’re going to be without me, we rubber band each day’s clothes together, grab a packet and you’re ready to go. It makes such a difference to helping get out the door for trips! Good job getting them started early! We are moving to India. My kids will need overnight clothes, outfit for the plane, change of clothes at the airport. We put 1 complete outfit per bag, labeled, compressed. These will go into their backpacks. The carry-ons will not need to be opened on the trip. I’ll be completing my bags the same way. Love using plastic bags to help compress everything. Always a good idea to pack a change of clothes in carry-ons! I use gallon ziploc bags with the day of the week written on them. A complete with socks and undies outfit goers in each. That way I can plan certain clothes for certain activities and if you squeeze the air out, it makes for more compact items. That certainly is a great way to save space and stay organized! Such an amazing idea! This is a great idea for adult too as over packing is so common! I’m actually going to do this for my next trip as I’m aiming to pack light! This is fantastic. Didn’t really think my son was old enough for such a task but after reading this it’s got me thinking that actually now would be a great time to teach him to do this and we have a holiday in a couple of weeks so I’m going to try it out. Good luck! The trick is to give them a little more authority and choices for each trip. Definitely start off with just having him choose his outfits and set them out for you to pack away. My girls have been packing their own suitcases now for years and rarely forget anything! HA!